CALEB DESCHANEL, COURTESY OF SONY PICTURES CLASSICS Saskia Rosendahl as Elisabeth May. Written and directed by Florian Henckel von Donnersmarck. Starring Tom Schilling, Paula Beer and Sebastian Koch. Now playing at the Landmark Plaza Frontenac Cinema. It was perhaps inevitable that the Cold War would become the fallback subject matter for today's European filmmakers with a historical bent, just as the two world wars were for their predecessors. 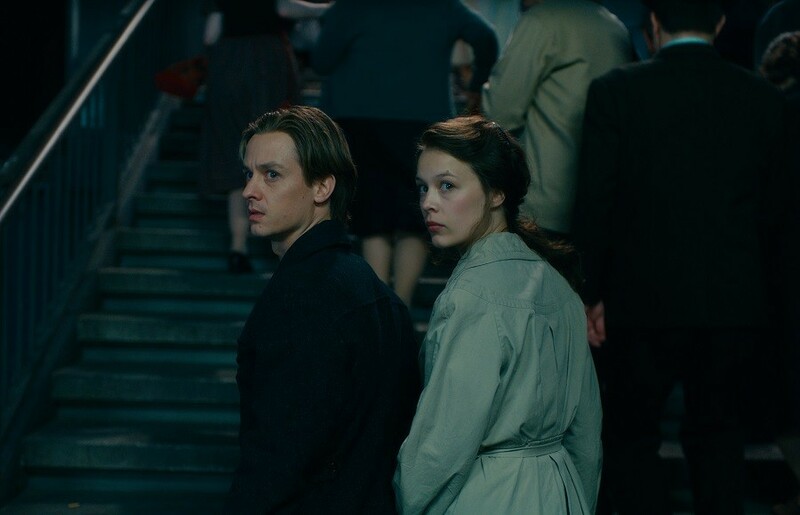 Like Pawel Pawlikowski's Cold War, Florian Henckel von Donnersmarck's Never Look Away uses Soviet-dominated Europe as the backdrop for a fairly conventional love story, viewing the era mostly with a kind of nostalgia. Set in East Germany, the film depicts the yearning not only for the forbidden fruit of the decadent West (the bourgeoisie freely listen to "Papa-Oom-Mow-Mow"), but also for the bad old days themselves. An oppressive system doesn't seem all that bad when you're young and in love. Spanning roughly a quarter-century, Never Look Away is a rambling film with a simple central plot. Ambitious young painter Kurt Barnert (Tom Schilling) wins the love of fellow student Ellie (Paula Beer), daughter of a prominent but overbearing doctor, while laboring to find his own vision under the constraints of Soviet realism. The period setting and political signposts are just elaborate window dressing for a familiar story of love overcoming disapproval, where the demands of a party line are far less urgent than the pressure of awkwardly meeting your mate's parents for the first time. Nominated for two Academy Awards (for best foreign film as well as for Caleb Deschanel's cinematography), it's a sprawling mess of a film, endearing but empty. Von Donnersmarck aims for an epic, complete with weighty themes and historical significance, but the pieces don't really add up. It covers a lot of territory — Nazism, the bombing of Dresden, forced sterilization, cultural totalitarianism, post-war rehabilitation, even painting versus photography — but it's all just historical name-dropping, contrivances that tie together narrative loose ends. The opening scenes during the Nazi years tell the story of a young girl driven to madness and death by the state and provide a bit of back story for one character. It also establishes a tenuous historical connection to the later events by reminding us that the Nazis also disliked "decadent art." Tom Schilling as Kurt Barnert, Paula Beer as Ellie Seeband. After two hours of digression and a considerable amount of time spent presenting Beer sans clothing, the art world takes prominence in the film's final hour, as Kurt and Ellie end up in a prestigious school in Dusseldorf. Dominated by a sphinx-like professor (modeled after Joseph Beuys), the art school circa 1960 is a hotbed of late modernism — which turns out to be exactly like a TV sitcom's version of modern art from that same era. Students shoot arrows into canvases, naked boys roll paint over their bodies and paint-covered gymnasts turn somersaults across rolls of paper. Kurt struggles to find the big theoretical idea that will drive his work. He does, but von Donnersmarck manages to treat his achievement as both portentous — his paintings appear to tie up most of the film's plot lines — and trivial. After three hours of showing Kurt's aesthetic struggle, the film ultimately dismisses art as irrelevant, merely a sign of his dedication. This applies not only to Kurt's faddish shifts of style but to art in general: Ellie's own ambitions to design clothes are mostly dropped the second Kurt asks her for a date, and the other artists and students mostly function as buddies cheering on the young hero. There's a curious contradiction at the heart of Never Look Away, one that ultimately diminishes its emotional resonance and makes nonsense of its Twentieth-Century European History for Dummies approach. Von Donnersmarck clearly wants the viewer to empathize with his young couple. But while he's made them likable, he's left out any other human characteristic. They're surrounded by powerful forces and monumental events, yet they barely notice. Never Look Away is history told with a shrug; its protagonists move through cataclysmic events with an irrelevance that makes Forrest Gump look like an action hero.